WASHINGTON, Feb. 3 (UPI) -- Al Webb, a jack-of-all-trades American reporter awarded the military Bronze Star for battlefield heroism as a Vietnam War correspondent, a rare honor for a civilian, died Jan. 25 in Banbury, England. He was 79. The cause of death was listed as complications of pneumonia and diabetes, said his wife, Elizabeth. In a half-century of distinguished reporting, Webb's bylined stories spanned the globe from the civil rights battlefields of the American South to the rice paddies of Southeast Asia to Cape Canaveral and the Houston Space Center for man's first tentative steps to the moon and beyond. He spent most of his career -- 28 years -- with United Press International, separated by a few years in the 1980s with U.S. News and World Report. He was a quick-witted, fast-talking and engaging reporter with a built-in knack for news agency work, which placed a premium on fast reporting and transmission, often with difficult pre-Internet communications from far-flung locations. He thrived on UPI's fierce competition with its arch-rival, the Associated Press. Like many of his agency's contemporaries, Webb, although trained primarily as a print reporter, was also an early example of today's multimedia journalist, taking photographs of soldiers in battle and filing radio reports, as well. 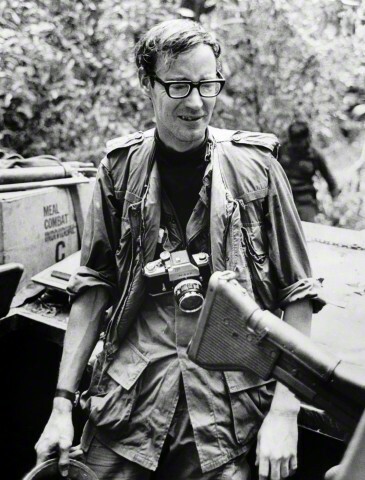 He was one of three civilian journalists awarded Bronze Stars, with Combat Distinguishing "V" Devices, for evacuating a wounded Marine in the Vietnam War's bloody Tet Offensive in 1968. The others were Charles Mohr of The New York Times and David Greenway of Time magazine. (Another UPI reporter, Joseph Galloway, received a U.S. Army medal for valor for rescuing soldiers in combat in Vietnam). Recounting the incident later, Webb said he became more combat corpsman than journalist when a Marine near him was shot in the throat during the battle for Hue. Webb said he and a Marine sergeant quickly "got the wounded guy under each arm and hauled him about 50 yards through some thick foliage." Mohr and Greenway arrived on the scene, and the "lot of us managed to find a blown-out door to use as a makeshift stretcher and were loading the Marine onto it" when the group was hit by an enemy rocket. "I looked down, and my lap was full of blood," Webb said. "Most of the blood, alas, was from the poor Marine, when the back of his head just fell apart in my lap." Still, Webb had sustained shrapnel wounds in the head, arm, rear end, leg, ankle and foot. Webb, the gravely wounded Marine and Greenway, who was also hit, were loaded onto a truck and hauled to the rear for medical attention. The Marine died there as he lay next to Webb. As the helicopter was lifting off, enemy fire hit it, but caused little damage. He was later evacuated to Saigon and then to Bronxville, N.Y., for more surgery. Years later, then-Marine commandant Gen. Robert Barrow read about the incident and invited the three journalists to a ceremony at the Marine Barracks in Washington in 1980 and awarded each the Bronze Star, with Combat "V."
Alvin B. Webb, Jr. was born March 14, 1935, in South Carolina, raised in North Carolina and Tennessee and educated at Duke University. His career in news began at The Knoxville Journal, but in 1956, he joined the Raleigh bureau of then-United Press. Over the next three decades, he would be assigned to a dozen UP and UPI bureaus on three continents and would report from even more parts of the world. His earliest assignments kept him in his native South, including coverage of the emerging civil rights movement. With the United States gearing up its infant space program in 1959, Webb was assigned to open a new bureau at Cape Canaveral to cover it. Its internal UPI "bureau code" designation was "BW," standing for "Bird Watch." From there, he reported on the early unmanned rocket launches, followed by the Mercury 7 program of manned U.S. space flight. Webb later opened another UPI space reporting bureau at what is now the Johnson Space Center and continued his coverage of the accelerating U.S. effort to fulfill John F. Kennedy's promise to send a man to the moon before the end of the decade. But with a war rapidly escalating in Vietnam in 1966, Webb requested and got a transfer to Saigon. Once there, Webb, a cat fancier, insisted to fellow UPI staffers that he got regular early warnings of danger from his Siamese cat, Snuffy, that was "able to hear rockets coming in" and alert him by furiously spinning around. He later said he considered the Tet offensive to be "the single most important story" he covered. After recovering from the wounds sustained in covering it, Webb briefly returned to Vietnam, but when he was deliberately deprived of field assignments for his safety, he asked UPI for another foreign posting. He became the second-ranking editor at UPI's European headquarters in London and later Brussels, then moved to Hong Kong as the agency's Asia Division news editor. In the mid 1970s, Webb was recalled to UPI's New York headquarters, where he edited major breaking stories, including the escape of Martin Luther King Jr.'s killer, James Earl Ray, and the 1976 Israeli commando rescue of 92 countrymen held by hijack terrorists in Entebbe, Uganda. But he also remained a leading UPI "fireman," covering big stories, including the 1978 Peoples Temple massacre in the South American nation of Guyana, where an unusual Northern California cult, which mixed fundamentalist religion and Marxism, had set up a jungle commune to get away from mounting legal troubles back in the United States. At a remote airstrip near the Jonestown compound, named for leader Jim Jones, armed members of the group killed California Congressman Leo Ryan, who had come to investigate reports of abuse and mistreatment from relatives of group members, and four members of his party: three journalists and a would-be cult defector. Several others were badly wounded, including Ryan aide Jackie Speier, who now represents much of Ryan's old district in Congress. Jones then ordered his followers to kill themselves with a cyanide-laced drink, which Webb always pointed out was NOT the Kool-Aid of erroneous legend and current jargon, but rather, Flavor-Aid. Jones' armed guards enforced his orders on those reluctant to follow. Webb, sent to head UPI's coverage and clad in a black turtleneck sweater in searing tropical heat, overcame communications difficulties to get out the bizarre story to a disbelieving world. He wrote and dictated stories over a single phone line to UPI's New York headquarters, shouting at editors there to keep the phone line open around the clock for days to send stories, photograph and radio transmissions. Webb later recalled, "We weren't sure at all at the start as to just what the death toll would be, but I seem to recall we believed it would run maybe a few score -- 50 or 60, say." Then the reported number of dead escalated, jumping up and up, prompting Webb to send new updates around the clock. It became a grisly task. "U.S. authorities started coming out with the real totals, 525 and more, and these were starting to change at the rate of once every 30 to 45 minutes," Webb said. "Then I was told at least 600, maybe more, and I was momentarily stunned, or shocked, or something . . . I lost my breath about here. "It was all turning surreal, and numbers were just grotesque symbols that I really couldn't relate to people. I kept on writing and dictating. I had barely gotten 750 at least out, when I had to tear that sheet out of the typewriter to put yet another number -- this one over 800. Then it became more than 900 and rather quickly -- and remarkably, I think, considering the circumstances -- 911. The exact number turned out to be 913. It is a number I've never forgotten." Not long after returning to New York from Guyana, Webb was assigned as UPI manager in increasingly chaotic Beirut, Lebanon. The city once known as the "Paris of the Middle East" had become the center of a decades-long sectarian civil war. Even in the middle of it, Webb's kindness to homeless felines was again on display. He gathered up a number of stray cats and housed them in his room at the Commodore Hotel -- home also to the foreign press corps. In the early 1980s, Webb moved to U.S. News and World Report and also returned to London, to which he had become increasingly attached since his posting there in the early 1970s. In 1986, he returned for a second London turn with a now rapidly shrinking UPI. He later switched to financial journalism for Bridge Information Systems, which was subsequently acquired by Reuters. In 1992, Webb became a British citizen and lived in England the rest of his life, occasionally spotted wearing bowler hat and tie that would have shocked colleagues and friends elsewhere in the world and become the rare American to embrace the game of cricket. He was a longtime member of the Surrey County Cricket Club and even became qualified to be an umpire at minor local matches. He also liked to host an annual home party for guests to watch the annual Oxford-Cambridge boat race, as well as his annual "Christmas Party," held in July because Webb believed "it's a much better time for Christmas." He remained active professionally, with part-time journalistic work for the Voice of America, Religion News Service, The Washington Times and even a still-smaller UPI. On UPI's centennial anniversary in 2007, he told colleagues at The Washington Times: "UPI was my first, last and only love in journalism. The thrill of that competition, the absolute enjoyment of getting a story, of being accurate. It was the most fun I had in my entire life. Our mission was to get the facts down in an interesting order and let the reader make the conclusions. There was real integrity in that." He is survived by his wife, Elizabeth, and an undetermined number of cats. (Former UPI staffers William Wright, Ron Cohen, Richard C. Gross and Michael Keats contributed to this report.